BurgerClub is fun! Not to take way from our dedicated quest to provide an unbiased list of Winnipeg’s best burgers, but burger eaters are a very entertaining bunch to hang out with. I’ve noticed the free form comment cards seem to be less about the burgers and more about the other diners. Fear not though, the group still rates the various burger attributes (listed at the bottom of this blog) and we average the results to give you, our dedicated readers, a burger rating that you know you can rely on! This week we have a new burger leader - Charlee’s! When you step into Charlee’s you’re treated to an “atmosphere (that) is cozy and relaxing and full of funky modern décor including my favourite parts, the awesome photos of local scenery blown up and cut into pieces like a puzzle! I also always get a smile out of glancing at the Alice in Wonderland tiered cake on their counter.” The only incongruous element was the music - apparently the cook’s a head banger. It wasn’t loud, but every once in while you’d become aware of the ambient thrash. The table surface was interesting - and we only noticed because writing the little review slips against the table made you’re writing go blurry. One diner figured it was a Braille message saying “Om” over and over. The price was very reasonable - especially for being served. 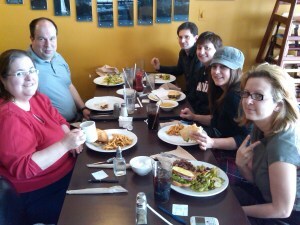 Today all the burgerers had either a bacon burger or fat boy. There was some debate over whether Charlee’s BBQ Tex Burger should be called a fat boy. I figure if it’s got lettuce and tomato and in the absence of cheese and bacon - it’s a fat boy. I make the rules so I win :) Like Luigi’s, it came with onion rings. One diner picked their onion rings off though; who doesn’t like onion rings? The patty was “free range” (a.k.a. hand formed) and very, very tasty. The lettuce and tomato were fresh and ripe, and the pickle slice - large. The bun did the job nicely and was grilled. It was a larger patty than the bacon burger. In most of the restaurants we’ve been to, the patty can get lost in the lettuce and tomato but Charlee’s compensated. 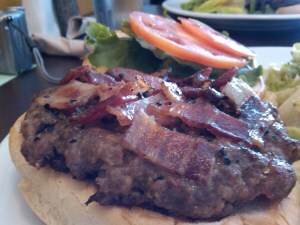 The Peppercorn Bacon Burger had lots of flavour! I really enjoyed mine. 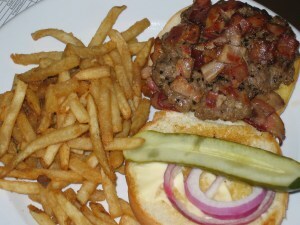 The bacon was chopped up into perfect little bite sized pieces, fried to perfection and covered the top of the burger. That’s the way to do it - pay attention The Nook! 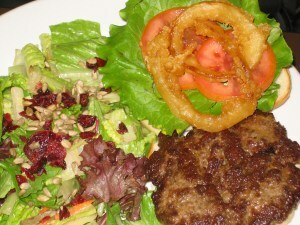 The peppercorns really came through - it was a nicely spiced burger and you could still taste the beef. The overall flavour was very well balanced. 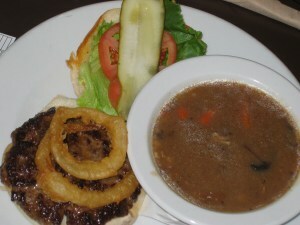 One diner commented they would have liked more mayo and onions on the burger though. The soup choices were delicious. My only complaint about the whole meal was the Caesar salad I ordered came with prepared croutons which *really* detracted from an otherwise nice salad. Savvy diners ordered the house salad which was yummy. Charlee’s has a lunch buffet that also looked quite good and most of the other tables were having the buffet. These lunches are always educational and today we learned Dr. Pepper trivia and how to make a Marvin the Martian costume. My lunch mates are good people and all, but what kind of person knows Dr. Pepper trivia!?!? As always Cary provided lots of material for BurgerClub to abuse him over (such as his inflatable brain) and educated us on Mole Day - it’s Oct 23rd - put it on your calendar. Also, Cary wants to get his hands on a leisure suit so he can be "Leisure Suit Cary" and expressed some interest in experiencing a "kitten pile". Nelson turned blue but can't remember why. Congrats on the return of the Jets! My wife wanted to go to a different burger place than the normal places. I decided to see what Burger Club suggested. 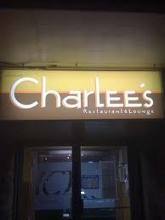 Charlee's was our choice. So the 3 of us were off (me, wife and 3yr old son). If you are use to the messy Greek burger this isn't the place. This is a little neater and more upscale. My wife and I had the peppercorn bacon burger and our son had the grilled cheese sandwich. 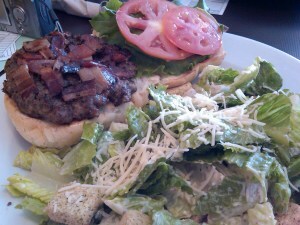 The peppercorn bacon burger was flavorful and had a different taste compared to your typical Greek burger. The bun could have been fresher though. Fries were like those you get at McDonalds. The Poutine was less than stellar. Service started off strong but quickly died off. The meal for our boy was brought out quickly but drink refills were sadly lacking. At one point I had to go up to the front counter to ask for more. The waitress claimed that she wasn't use to being the only one on staff. Yet, there was only 1 other table besides us. She was polite though. She did add gravy to my meal, which I didn't ask for but was under the impression it came with it, and charged me for it. Total cost for 2 Peppercorn Burgers, Grilled Cheese sandwich, 2 soft drinks and 1 milk was about $30. Worth trying one more time. Glad you guys enjoyed the meals! I've been a server at Charlee's Restaurant for over a year and the food is what hooked from day one. 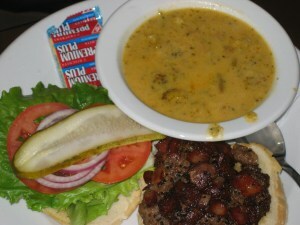 I can say that the Peppercorn Bacon Burger is by far the best burger and we strive to give the best service possible. I wish I would've been there to meet the Burger Club, sounds like a fun group. Husband and I decided to give this a try...it was Karaoke night in the lounge and we thoroughly enjoyed ourselves. I had the peppercorn burger which was good and burger loving husband had the swiss mushroom burger which he said was fabulous! The beers were cheap...even the imports! and Jewel, the Karaoke lady was terrific...she knows how to work a room. 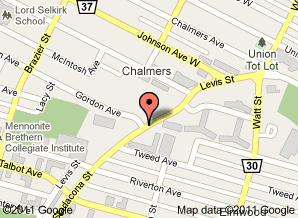 I've often wondered about Charlees as its in the hood and I pass it almost daily. Thanks for giving us a reason to try it out. We'll definitely be back.